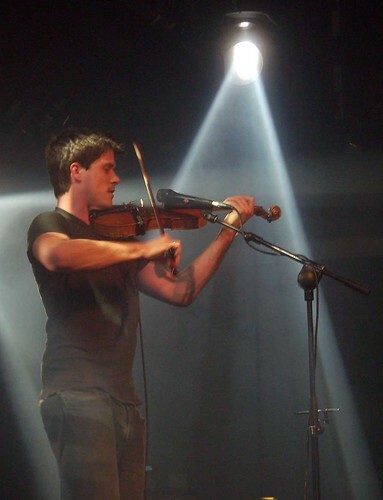 Seth Lakeman, originally uploaded by alister. Seth Lakeman is being marketed as the acceptable face of folk music. Yes he plays traditional tunes and traditional instruments. And there is no denying his virtuosity on the fiddle. But there is a bass guitar and drums in there too. What is more he is a good looking chap with a six pack and an enthusiastic female following. They certainly made themselves heard on Tuesday in the Liquid Rooms. I was a bit worried that Mr Lakeman would be a little too bland and FM for my tastes. However for the most part he stuck to sweaty, bouncy tunes that went down a storm with the crowd. An entertaining evening. Seth's website, myspace, wikipedia entry. bebo bands page. Hi, great website you have here! Seth's new album is wonderful and " haunt you " is dark genius. Seth is due to play at the Folk by the oak fest very soon, wish I could make it. Very interesting blog you have here !